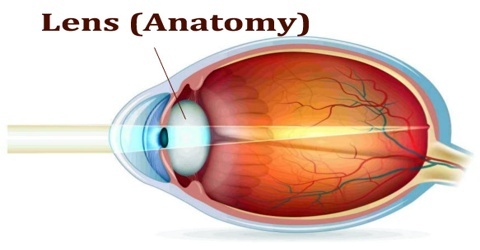 Lens is a transparent structure behind the iris of the eye that focuses light entering the eye on the retina. The lens is made up of unusual elongated cells that have no blood supply but obtain nutrients from the surrounding fluids, mainly the aqueous humour that bathes the front of the lens. The lens, by changing shape, functions to change the focal distance of the eye so that it can focus on objects at various distances, thus allowing a sharp real image of the object of interest to be formed on the retina. Lens is also known as the aquula (Latin, a little stream, dim. of aqua, water) or crystalline lens. In humans, the refractive power of the lens in its natural environment is approximately 18 dioptres, roughly one-third of the eye’s total power. The ability of the lens to adjust from a distant to a near focus, called accommodation, gradually declines with age, often requiring correction. Clouding or opacity of the lens, called a cataract, may also occur with age. Cataracts that interfere with vision can be corrected by surgery, during which the clouded lens is removed and replaced with an artificial lens. The human eye is a very complicated organ, but only a few structures in the eye are important for forming images of the objects that we look at. The lens focuses the light rays that pass through it (and onto the retina) in order to create clear images of objects that are positioned at various distances. It also works together with the cornea to refract, or bend, light. 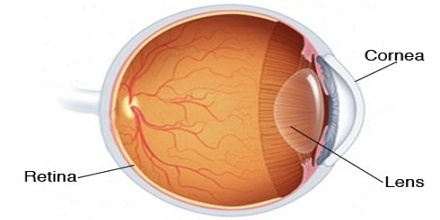 The retina contains specialized cells that are sensitive to light; these are called rods and cones. When the cornea and lens focus light onto the retina, the cells are stimulated and send signals to the brain. The lens is of ellipsoid, biconvex shape. An ellipsoid is similar to a sphere but stretched out, like an olive, and biconvex means it’s rounded outward on both sides. The lens is about 10 mm across and 4 mm from front to back in adults, although its shape and size varies as it changes its focus. The lens capsule is the smooth, transparent outermost layer of the lens, while the lens fibers are long, thin, transparent cells that form the bulk of the lens. The lens epithelium lies between these two and is responsible for the stable functioning of the lens. It also creates lens fibers for the lifelong growth of the lens. 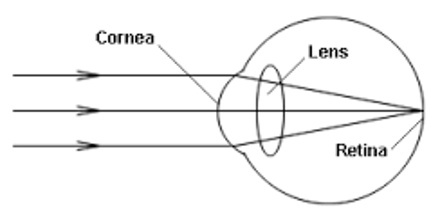 Lens is flexible and its curvature is controlled by ciliary muscles through the zonules. By changing the curvature of the lens, one can focus the eye on objects at different distances from it. This process is called accommodation. The refractive index of human lens varies from approximately 1.406 in the central layers down to 1.386 in less dense layers of the lens. This index gradient enhances the optical power of the lens. 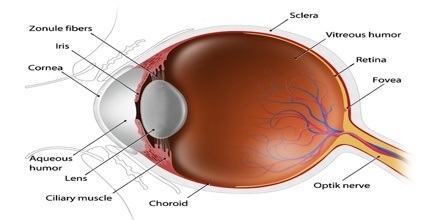 Common diseases of the lens include cataracts, which cause opacity, or cloudiness, in the lens. Myopia is a condition that causes objects that are far away to appear blurry and is commonly referred to as nearsightedness. Myopia is caused when light focuses in front of the retina. It can be corrected by placing a concave lens in front of the eye, either in the form of eyeglasses or contact lenses that causes the light to spread out before it enters the eye. Hyperopia occurs when light focuses behind the retina and causes objects that are nearby to appear blurry, a condition also called farsightedness. It is corrected by placing a convex lens in front of the eye to cause the light to begin to converge before it enters the eye. Other common ailments are presbyopia, ectopia lentis, aphakia, and nuclear sclerosis. Reference: healthline.com, study.com, britannica.com, wikipedia.